If you’re reading this, you’re likely in the market for a customer relationship management (CRM) system. That’s good news, because the right CRM system can take your company to new levels of productivity. As the name suggests, a CRM helps you maintain strong relationships with customers and prospective customers. It also becomes the central hub where all of your customer and sales data is stored, allowing you to work efficiently and report on key metrics. Choosing a CRM that is appropriate for your company and your industry is one of the most important business decisions you’ll make. And thankfully, you don’t need to have a software degree to make a wise choice. You simply need a clear vision of the business problems you’re trying to solve, along with some solid side-by-side comparisons of the options available to you. 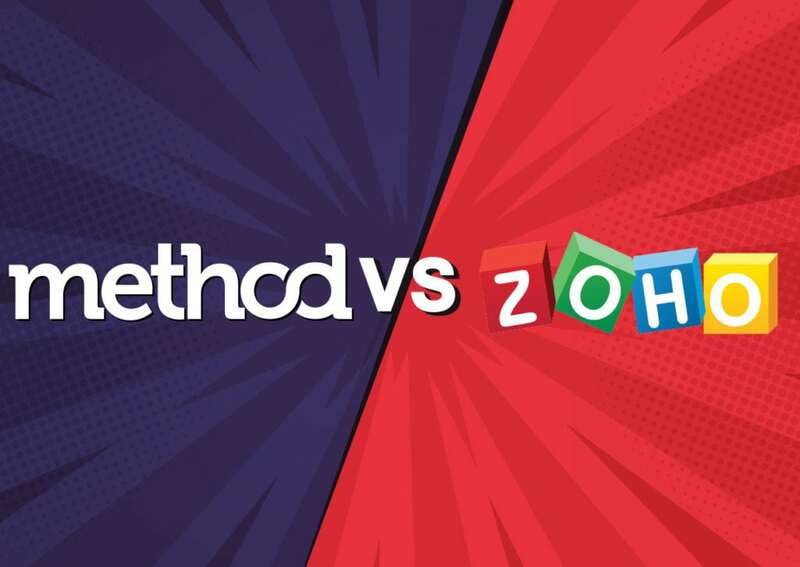 In this post, we’re presenting a comparison of Method and Zoho. Every CRM has certain key features that make up the core of its offerings. When shopping for a CRM, start by looking at these key features to determine whether the system could potentially match your business needs. Built exclusively for QuickBooks users: the two-way integration mirrors customer and transaction data seamlessly between Method and QuickBooks in real time. Organize your sales process and win more deals by automating lead collection and centralizing your leads. Streamline operations and service customers efficiently without loading undue administrative work onto your sales team. A 360-degree view of each customer helps you provide superior customer service and drive repeat business. 100% customizable: Future-proof your business with software that grows as you do. Automates repetitive tasks to allow sales reps to spend more time on selling and less time on data entry. Multi-channel support allows you to reach your customers via phone, live chat, email, or through social media. Allows for the addition of industry-specific modules and custom buttons to adapt the interface and functionality for your business. Lets you view what your customers and prospects are looking at online and whether they are opening your emails. Advanced CRM analytics give you deeper insights into how your business is functioning. After identifying key features that would benefit you, it’s helpful to know if the CRM you are considering was built with your industry in mind. Here are some of the industries that Method and Zoho are well-suited for. Method serves customers in a wide range of industries, including manufacturing, construction, accounting, consulting, education, creative agencies, field services, and nonprofit. Zoho offers customized vertical solutions for a variety of industries, including automotive, environment and sustainable energy, real estate, tourism, retail, nonprofit, insurance, telecommunications, and event management. Before adopting a new CRM, it’s a good idea to check whether it can integrate with the other software programs you already use. This will ease the transition to a new system and ensure that no customer data falls through the cracks. Luckily, both Method and Zoho offer integrations with common software applications. 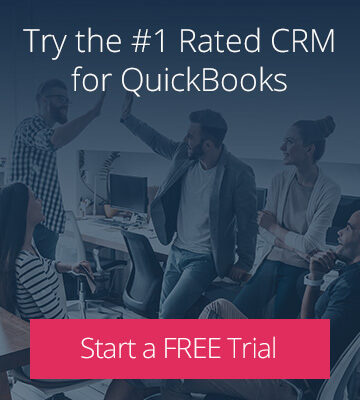 QuickBooks: Method is the CRM industry leader for QuickBooks integration and is compatible with all versions of QuickBooks Online, Pro, Premier, and Enterprise. 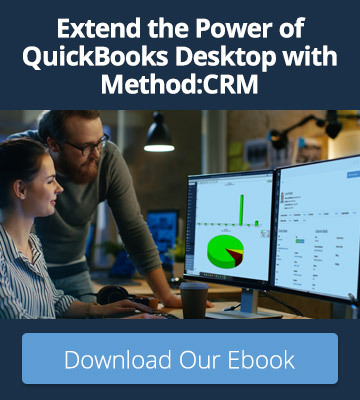 The powerful two-way sync between Method and QuickBooks allows customer, vendor and transaction data to sync between your CRM and your accounting software in real time. Gmail: Bring your CRM inside your Gmail inbox with Method’s free Sidebar for Gmail. When you open an email, the sidebar displays the contact’s phone number, address, balance, QuickBooks transactions, CRM activities, opportunities, cases, and documents. You can also save new data to Method directly from Gmail, eliminating the need to switch between tabs. Outlook: Similar to the Gmail integration, Method’s free add-in for Outlook lets you see your whole relationship with customers, leads and vendors at a glance. When you open an email, the add-in displays the sender’s contact information alongside valuable QuickBooks and CRM data. Easily save new leads, activities, and opportunities to your Method account — all without leaving Outlook. MailChimp: Rather than manually exporting contacts from Method and importing them into MailChimp, this integration does the work for you. Simply select the CRM contacts you want to market to, then send them to MailChimp in just a few clicks. Google Calendar: View your scheduled CRM activities, such as meetings with customers, follow-up emails to leads, or conference calls with vendors, right in your Google Calendar. You can also create and update activities in your Google Calendar that will sync back to Method. QuickBooks: There are QuickBooks Desktop and QuickBooks Online extensions for Zoho CRM. Choose which records you want to sync between programs and customize the field mapping from your Zoho dashboard. Google Drive: Easily sync, share, and collaborate on documents associated with customer records in Zoho. Microsoft Office: Sync Microsoft Office documents, spreadsheets, presentations, and databases with Zoho CRM records, then manage them from within Zoho. MailChimp: Sync MailChimp lists with Zoho Campaigns, get notified in Zoho when subscriber profiles are updated in MailChimp, and merge fields between MailChimp and Zoho. Eventbrite: Quickly capture new leads from events and trade shows by syncing your Events and Tickets data into Zoho. Many CRMs include features beyond the basic lead and customer management tools. While these may not be highlighted as prominently on the company’s website, these selling points add value to the products nonetheless. Here’s what Method and Zoho have to offer. Method:CRM is built on a 100% customizable, no-code platform. This means you can continuously build on it to better suit your needs, without needing to hire a developer. From adding new fields to automating processes to building custom apps, Method has the flexibility to become much more than a CRM. And when combined with the deep QuickBooks sync, this flexibility allows you to create optimal workflows for your business. Zoho offers industry-specific modules that can be included in your CRM to tailor it for your business’s needs. The Zoho marketplace also includes a wide range of extensions for other business functions, like FedEx shipment tracking, SignEasy document signing capabilities and more. Before implementing any new software, prospective buyers should ideally be able to test out the capabilities of the program. To that end, most CRMs offer a no-commitment free trial period. Method offers a 30-day free trial that allows users to fully explore the functionality of the system. There’s no contract, no obligation, and no credit card required. The free trial also includes a free hour of customization services with an in-house customization expert so you can see the true potential of customizing Method for your business. In order to begin the trial, you must sync your QuickBooks data with your Method account. Zoho offers a 15-day free trial of all four of its subscription plans (described below). No credit card is needed to sign up. Zoho also offers a free CRM for up to three users; the CRM includes basic functionality for sales force automation, workflow management, social integration, and team collaboration. For most businesses, CRM pricing will play a key role in the decision-making process. Luckily, most CRMs offer a variety of pricing and subscription options. Here’s what’s available for Method and Zoho. Method offers two subscription plans — Contact Management and CRM Pro. Both plans are available on an annual or monthly basis, with no contract required for the monthly basis. The Contact Management plan is $25/user/month when billed annually or $28/user/month when billed monthly. This plan includes everything businesses need to get started with customer relationship management, including QuickBooks sync, contact management, customer self-service portals, and custom app services. Additional modules for QuickBooks purchase transactions, email campaigns, and case management are available for either plan for $10/user/month when billed annually or $12/user/month when billed monthly. In addition to the free CRM described above, Zoho offers four paid CRM subscription plans. The Standard plan ($12/user/month billed annually or $18/user/month) includes everything in the free version. It also includes features such as sales forecasting, scoring rules, charts and KPIs, and web forms. The Professional plan ($20/user/month billed annually or $30/user/month) includes everything in the Standard plan. It also includes features such as email integration, social CRM, inventory management, and unlimited records. The Enterprise plan ($35/user/month billed annually or $45/user/month) includes everything in the Professional plan. It also includes features such as multi-user portals, custom modules and buttons, conditional fields, and conversational AI. The Ultimate plan ($100/user/month billed annually) includes everything in the Enterprise plan. It also includes features such as free premium support, automation suggestions, enhanced storage, and email sentiment. Good customer support is critical for companies implementing their first online CRM system. You’ll want to work with a company that stands behind its products and has support reps available when you may need them. Method offers a variety of support services including free 24/7 access to the online help center, webinars, and customization resources. Support reps are available over phone, live chat, and email Monday through Friday from 9 am to 6 pm EST. Zoho offers 24/7 access to their online help center and community message boards. Customers can submit requests for support by email or through an online form on the company’s website. Phone support is available for paid CRM customers Monday through Friday, 24 hours a day. When comparing Method:CRM to Zoho CRM, you’ll see that both platforms can be used successfully by a variety of industries. Zoho is a great option for customers who are looking for a robust out-of-the-box solution, while Method’s deep integration with QuickBooks and infinite customization potential make it well-suited for companies who want a CRM that can grow along with them. All in all, the best CRM for your business is the one that helps you get more work done — so your CRM comparison doesn’t need to stop here. Sign up for a free trial of both systems and see which one is right for you!